Last weekend I attended the Tesol Greece annual convention called Be creative and Inspire. I gave a workshop on art and creative thinking in ELT. We explored how the integrated use of artful stimuli and thinking routines woven around social topics can foster the development not only of students’ language skills, but also help them develop their thinking. I hope it gave participants food for thought and encouraged them to explore the potentials that such an approach can have in the English classroom. There were about twenty-five people who attended the workshop which had three parts. In the first part we worked together on the Looking 10×2 routine with The Wrested Heart, an intriguing piece of artwork by Peggy Lipschutz, an American artist and activist. While the workshop participants were sharing their ideas, I wrote them on a flipchart board in a circle concept map. I used a red marker for their initial words and phrases and a green one for the ones they came up with when we repeated the routine. In the centre I wrote the title of the painting and the name of the painter. It was interesting to see the difference in the level of abstraction between the students in my classroom (age 11) and the teachers in this workshop. Is this because young students and teachers have different approaches to perception when looking at art? Approaches sometimes referred to as either top-down in the case of adults or bottom-up in the case of children. Perception means that we hypothesize about what we see. When adults perceive and interpret art, prior knowledge and experience may influence their reactions. In the bottom-up approach which is what children do, their perception starts right at what they have in front of them. They focus on surface features of the paintings. Yet having a second look or being provided with some additional information will influence their attention towards top-down processing. For example, when we worked on this routine in class, most of their first responses were factual (trees, woman, heart, hole, chest, hold, darkness) and at the same time their initial reactions were drawn more towards negative impressions (bad emotion, lonely, crying, sad). 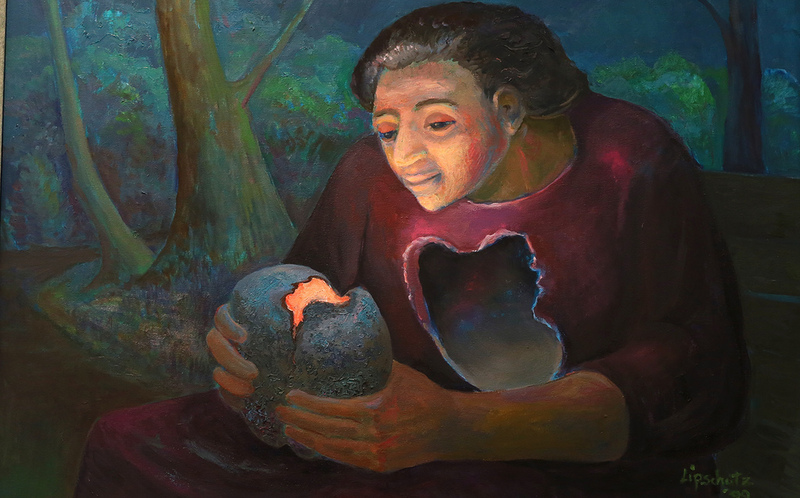 That looks quite natural to me since the image of a woman sitting alone in a dark forest with an empty hole in the place of her chest where her heart is supposed to be, alludes to something bleak. When we had a second look, however, their next round of words and phrases was different. They had the chance to notice details like the glow in the woman’s face which was a reflection of her shiny heart. This led them to observe more carefully her expression which now seemed to them peaceful and they came to conclusions that this woman may be sensitive, smiling and proud of herself. In the second part we had a look at some more routines I have used in class. This part was not that interactive as the first one. In the final third part we looked at some artworks and engaged in a free exchange of ideas on the routine they would use or which topic they could associate the artwork with. There were interesting ideas put forward. 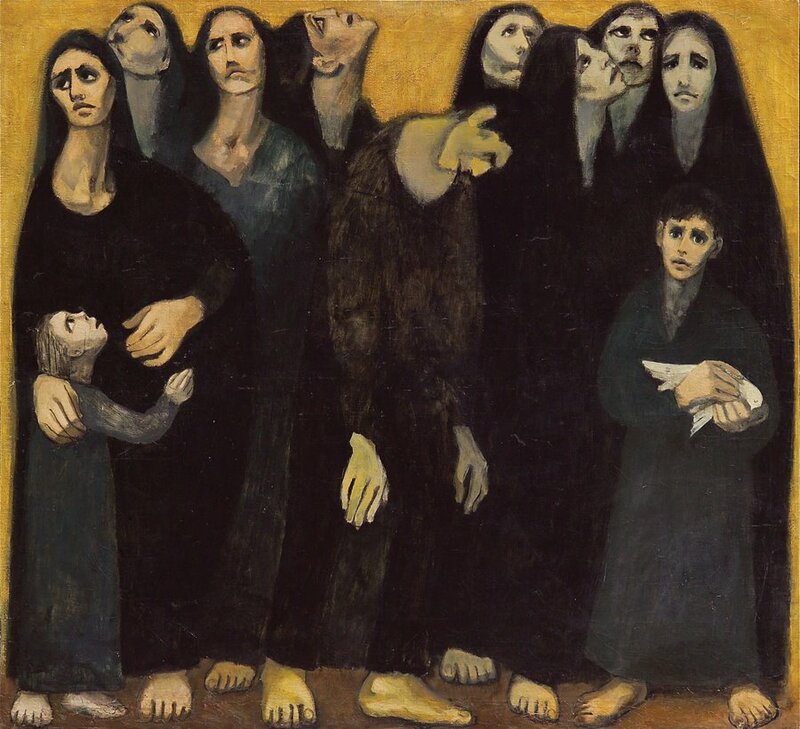 For example, when I showed them Then what or What after, a painting by Louay Kayyali, a Syrian visual artist, one of the participants offered the idea of using the Sentence, phrase, word routine. This is a routine that is targeted towards reading and capturing the essence of a text. It may be an oxymoron to use it with an image instead of text, but it is a splendid idea. What this participant did was to turn a receptive routine into a productive one. Asking students to cut down their expression to a single sentence, phrase or word, calls for them to focus their attention better to the meaning they want to communicate. Another interesting moment was when we were looking at the street art piece Killing ourselves by a Spanish artist, Santiago Pejac and discussed what topic they could associate it with. I had thought of linking it with forest destruction, but the participants put forward a range of other ideas. They suggested immigration, disconnected society, and social media alienation. It was a happy coincidence that they could not see the title of the painting at that moment because that would limit their ideas. What did you use to think about art and creative thinking in English language teaching before this workshop? What do you think about it now? I feel really grateful that the people who attended this workshop participated with warmth and were eager to contribute their ideas and comments even though what I showed might not apply to every individual teaching context. 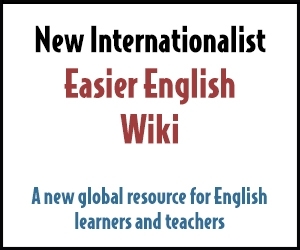 Here is the link to the workshop materials. It was our first day at school after Christmas break and we all looked a bit numb. There was a mixture of sadness that holidays had ended and happiness to see familiar faces again. We were also a bit tired and sleepy after a two-week period of waking up late. I felt it was important not to overwhelm students right from the get-go at 8:00 am on a Monday morning, but opt for a more open-ended, student-led activity. 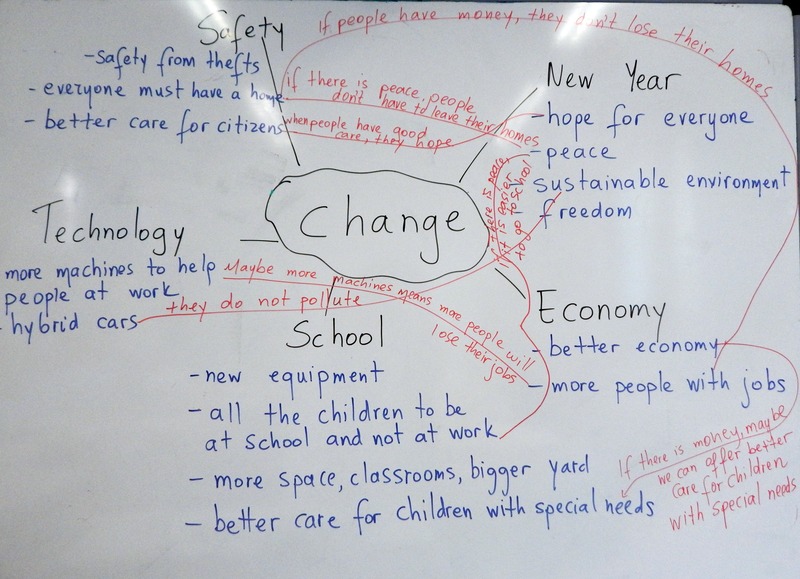 This post reflects on how we worked with two groups of sixth graders, mixed-ability A2- English learners, on the concept of “change” by using the thinking routine Making Meaning. The aim of the routine is to build collective meaning of words, ideas, concepts or events; a collective concept mapping. It is a new routine I had come across some time ago, but had not given it a try so far. I was a bit cautious not knowing how it was going to work with students. Yet, after having tried routines in my classes for a long time, I trusted in the results they can yield with students and the richness and originality of ideas they can trigger. In any case one can never find out until one tries and cautiousness was outweighed by curiosity and anticipation. In our case the concept was “change” and it emerged after looking at a visual stimulus. It was a street art piece which read: Happy New Year. The change starts here. 1.Think of one word that you associate/connect with change. Which word is this? This was done as a whole class brainstorming activity and yielded some first tentative responses. 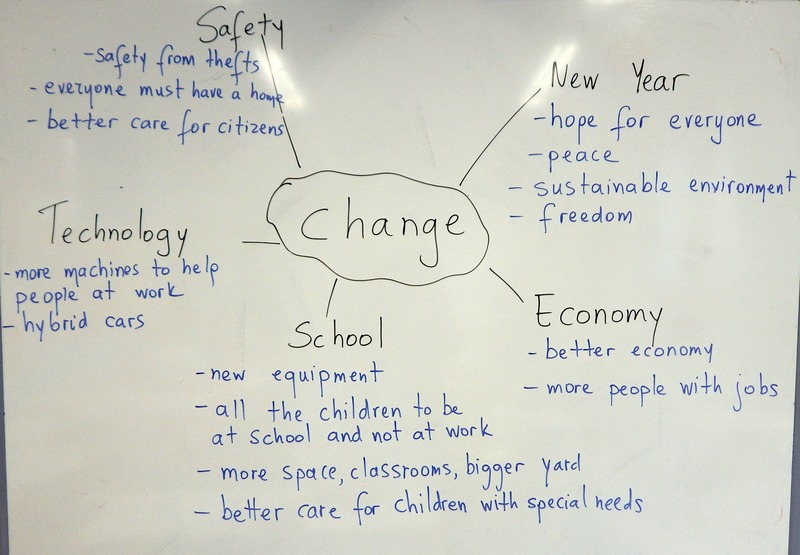 Students came up with the words: New Year, school, safety, technology, economy. 2. Now, can you think and add one more word or phrase under any of these four so as to tell me something more about it? 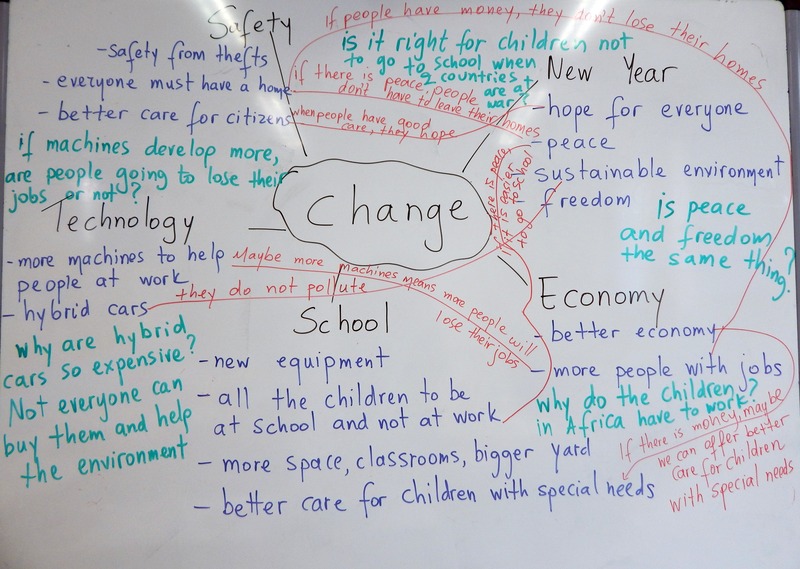 Students began to warm up and were able to contribute more ideas, there was greater participation and more words and phrases were added under the initial ones. 3. Look at all the words and phrases we shared on the board. Can you see any connections? Think and tell me about them. The third step found me coping with the practical issue of how to draw joining lines between the connections the children found and talked about, and how to write on those lines. It was quite an enjoyable stage as we were all taking notes, trying to accommodate on our concept maps the new information that came up from sharing ideas. It was also a moment that reveals so eloquently that thinking expands in multiple directions, it “does not happen in a linear manner” (Ritchhart et al., 2011). 4. Look at all our ideas shared on the board. Do you have any questions to ask about what we discussed? What kind of map is this? It was funny how on finishing with the four steps, students in both groups began making jokes about this kind of map they had in their notebooks, different for each one since their notes were personalized. Some of them had opted for a full diagram while a few others had opted for a mixture of diagram and listing ideas and questions as I noticed by a quick look at their notebooks. One student said that it was “a map not to find your way, but to get lost”, another added “yes, to get lost in ideas and thoughts”, a third remarked that “it’s a map of all the different, nice ideas we had in our minds” while some others were explaining to their classmates how they were able to navigate themselves in their maps through lines, arrows, colours, boxes and clouds. I told them this was a concept map and the term seemed to stick in their minds. The new language that emerged out of the students’ need to express their ideas while working on this routine was: connect with, associate with, concept map, economy, sustainable, equipment, space, hybrid, citizens, develop, thefts, special needs (first group) and connect with, associate with, concept map, radical, gap, reduce, increase, tax, racism, origin, argument (for the second group). The proper wrapping up of the Making Meaning routine is that students come up with their own definition of the word, concept, topic being explored. We did not have much time to do this individually as the session was coming to an end so I asked children to hierarchize the most important elements for them and came up with a joint very short piece of writing. I found it interesting how in both groups the routine facilitated the expression of a diversity of ideas that captured aspects of the issue ranging from the personal/school/local one to the wider “big global picture”. They associated the concept of change not only with themselves, their school, their relationships with classmates, but also with the current state of unemployment in the country, feeling of insecurity, loss of homes and the more global issues related to sustainable environment, gap between rich and poor, racism, injustice, war/peace. Each one of the questions the students asked at the final step lends itself to a new circle of inquiry. The Making Meaning routine helped smooth our way back into “school mode” and gain some energy after the Christmas-hynernation phase. It reminded me a lot of Chalk Talk, another routine that helps students build understanding collectively. For some pictures of classroom practice with the Chalk Talk routine you can have a look here and here. Ritchhart, R. Church, M. and Morrison, K. (2011) Making Thinking Visible: How to Promote Engagement, Understanding, and Independence for All Learners. San Francisco: Jossey-Bass. There was a unit on shopping we were recently working on with my sixth grade primary school students that triggered the idea of showing them Vincent Van Gogh’s “The Potato Eaters” and relating it to poverty. After looking at coursebooks images of happy people shopping and paying at supermarkets, and reading texts on the numerous goods one can buy there, I could not help but wonder how the children would react to the issue of poverty, especially since they are growing up and living in a country constantly descending into poverty because of the prolongued economic recession. There was also some reaction on the part of the children while working with the coursebook when a couple of them pointed out that “well, if you don’t have money, you can’t buy anything”. That made me even more curious to find out what the students see around them, in their surroundings. For these children, who in their majority come from families who can provide for the basics and in some cases more than that, are the poor invisible? or even worse “written off as trash” as John Berger phrased it? The “Potato Eaters” (1885) by Vincent Van Gogh is a realistic painting about harsh country life. It depicts five peasants sitting around a table, eating potatoes. The colours are dark and gloomy and the only light source comes from an oil lamp on the ceiling, at the centre of the panting, which sheds light on the facial expressions of four of the figures. What’s going on in this painting? This is the Visual Thinking Strategies approach (VTS) to finding meaning in imagery, developing visual literacy through learning on the arts, fostering thinking, and communication skills—listening and expressing oneself. Following a constructivist, developmental approach to aesthetic appreciation, VTS views the teacher as the facilitator who allows the students’ mental frame to evolve by making connections, new constructions, and building meaning in new kinds of ways as they weave their understanding and interpretation of a work of art. In the first case, ideas involved “fish”, “apples”, “potatoes”, “tea”, “coffee”, “cocoa”. In the second case, some children believed there are “poor people in a house” while others believed the people in the painting are “in a war” situation. I finally asked the children if the atmosphere in the painting is cold or warm. Opinions were divided. Others thought it was cold because the people in the painting were poor, tired, sad. Others, however, thought it was warm because these people were all together and were sharing their food. As students were expressing their ideas and listening to each other’s ideas, I facilitated note-taking by writing key words and phrases shared, when speaking, on the board for all to see. I also helped them with the language they needed in the flow of the conversation which involved items like “hiding shed”, “platter”, “serve”, “shelves”, “in the background”, “all together” “atmosphere”, “I believe”, “in my opinion”. 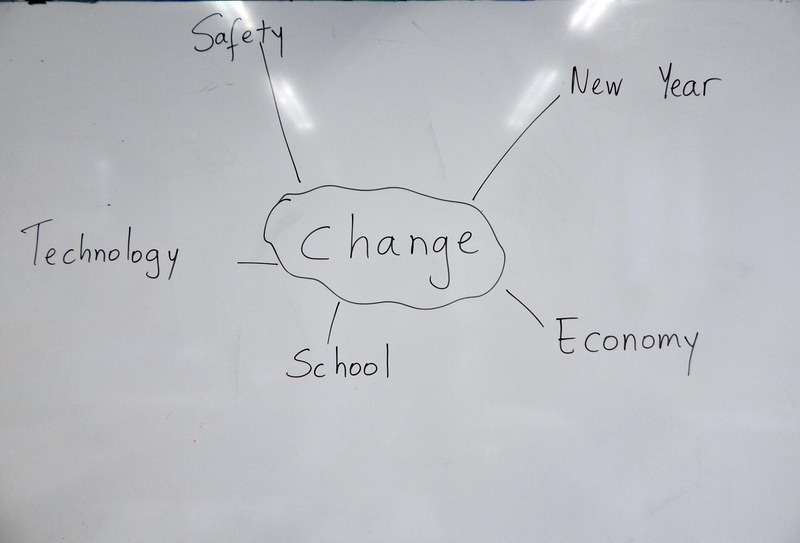 When this session ended, I revealed the title and asked them to write a text on what we did in class, drawing on the classroom discussion and their notes. Children came up with shorter or longer texts that ranged from simple descriptive accounts of the painting to more elaborate reflective texts where they incorporated their own thinking as well as their classmates’ thinking. All of them responded well and even struggling students found the activity accessible since the in-built differentiation and the fact that their writing was based on classroom experience was of considerable help. 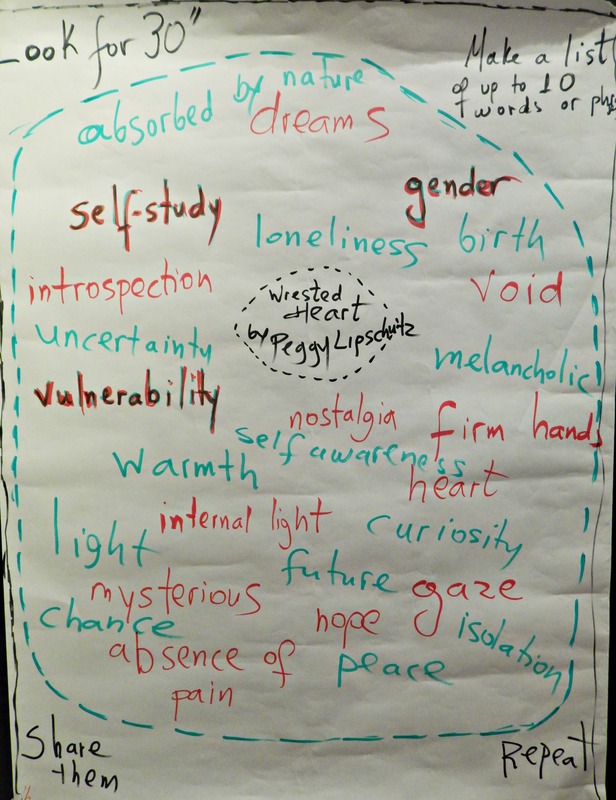 The new vocabulary that emerged out of this session included items like “ceiling”, “illuminate”, “bony” (fingers), “kerchiefs”, “caps”, “bright”, “little, a little, very little”, “depressing”, “gloomy”, “feeling”. I also provided them with the terms “monochromatic”, “realistic” and “naturalistic” related to the artistic elements of the painting. I finally explained that Vincent Van Gogh made this painting for two reasons: he wanted people to see that he was a good artist, and he wanted to show how hard the life of poor peasants is because he lived among them at that time. “Peasants” was added to our words list and I asked the students’ opinion on whether the painting was successfully showing what it was supposed to show. I also asked them to look around them, think, and draw their own images of poverty along with a short description and rationale. The children did look around them and what they brought in class indeed reflected the face of poverty in our surroundings. In the final sessions, they presented their images to their classmates and talked about them. The majority chose to depict people scavenging food, paper or anything useful from rubbish bins which in the Greek debt crisis context has been rapidly rising and has become a way to survive. At times they associated it with the country’s shuttered industrial infrastructure, scarcity of jobs or poorly paid ones. Begging in the streets, in the subway, in front of global supermarket chains and homelessness also featured in their work. This was again at times related to the rising unemployment in the country and the rising cost of living. On completing these series of lessons, children had come in contact with art, had shown interest in both the aesthetic and social aspect it embraces, had had the opportunity to express themselves in verbal and visual modes, and had seen and identified the often unseen and overlooked. Their responses were marked by awareness and emotional and cognitive engagement. As they were trying to make meaning of poverty through drawing their own images and writing about them, they employed their thinking, planning, and connecting skills. There were interesting signs of individual engagement with putting together their own works of art and reasoning their choices. Of course, there were varying degrees of conscious connectivity among the children which have to do with their diverse degree of maturity, artistic and language ability, familial and social context. Ideally, a related problem-solving situation that would push children’s thinking beyond identifying and empathizing towards developing and initiating ways of tackling with the issue of poverty should follow. Poverty is a very complex issue with the unequal distribution of wealth at its core. We did not go that far. Food for thought for the future. This is a post about a fine resource I came across and how we used it in class. It is the UNICEF’s Cartoons for Children’s Rights series, a treasure chest of a animation spots based on the articles of the Convention of the Rights of the Child. The duration of each spot is less than a minute and all of them are non-verbal with captivating images full of visual information. They call for students to watch carefully, observe, and look for visual details that will help them describe, decode and understand the message of the each spot. 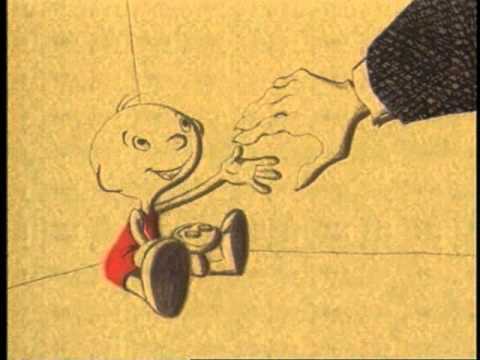 There are two such videos available on youtube: Cartoons on Children’s Rights 1 and Cartoons on Children’s Rights 2. In my case, I made a selection of spots from the first video and worked on them with mixed-ability A2-, sixth grade, primary school children (11-12 years old). slow down and watch carefully each spot. practise their speaking and communicative skills in the ensuing classroom discussion by responding to a set of questions, listening to each other’s ideas and building on them. practise note-taking and paragraph writing. express themselves creatively in verbal and non-verbal ways through drawing and sketching. think about their rights, and learn that children around the world lack things they take for granted. explore and discuss their ideas, and form their own opinions and values with no fear of right and wrong answers. show the spot pausing it at the moment before the relevant right appeared verbally. prompt a classroom discussion by asking questions. write the ideas shared in class and key words on the board, while children kept notes. ask them to guess what the right might be. Before starting, I told children that they would use their notes for their homework assignment which would be to produce short texts describing each animation spot, and writing about their thoughts, feelings and opinions. Lower level students could write sentences about each spot instead of a text. I told them that if they wanted to they could also make drawings about the spots. We watched a total of nine animation spots and we needed three forty-minute teaching sessions. Italy (RAI Television). Created by Guido Manuli. 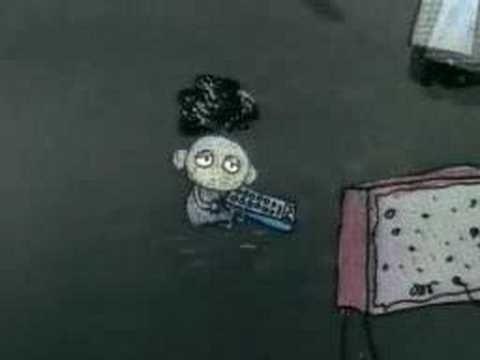 What were the children in the beginning of the spot doing? How do you think they were feeling? What was the child in the room doing? How do you think he was feeling? Finland. (EPIDEM). Created by Antonia Ringbom. What is the child doing? What kind of images/programmes is he watching? Do you think this is good for the child? Why? Is there an adult with the child? USA (Nickelodeon). Directed by Bob Peterson. 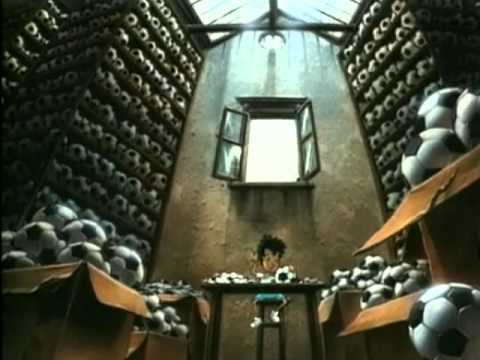 Designed by Byron Glaser and Sandra Higashi CGI, in association with Pixar and Zolo, Inc.
What is happening in the spot? What do the figures in the spot look like? What is the little figure doing? Does the big figure like this? Why do you think so? What do you think of the little figure? How do you think the little figure feels? Can you see any colours in the room? USA (Matinee Entertainment). Directed by Frank Saperstein. What birds did you see in the beginning of the spot? What else did you see in the sky? Where did the babies land?/Where were they born? Children’s wisdom came up with the answer: “Because both storks and airplanes fly, but one carries life while the other death”. It was also interesting to see how children brought to class their experience from watching and listening at home about the war in Syria. Some of them knew about the underground playground created for children there so that they can have a place to play safely. Denmark (A Film ApS). 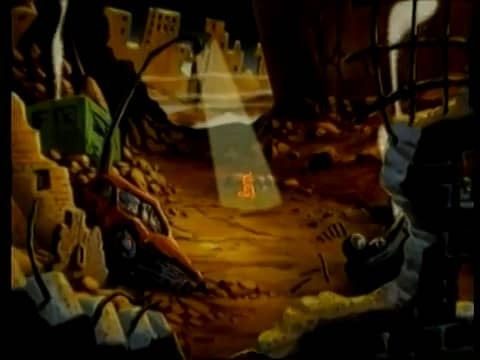 Directed by Jørgen Lerdam. What did you see in this spot? What was the child in the spot doing? What was he playing with? Whose is the hand that takes the child? Do you think this person has good intentions? What makes you say that? What else did you see or notice in the spot? Taiwan (Wang Film Productions). Directed by Robin Wang. Created by Pongo Kero and Fish Wang. What did you see in the beginning of the spot? What does the house look like? How do you think the child feels? What happens to the child later? Think about the children’s rights that we watched, talked and wrote about. Look closely around you, notice details in your room or your house. Choose one or more rights and take a photo that you think is relevant to the right/s you chose. No photographs of faces of people. -What is happening in your photo? -Why did you choose to take this particular photo? -What is the right you want to show here? What I found particularly effective while working on these spots was the way concepts like child labour, appropriate information, self-expression, trafficking, abduction, or neglect were received, recognized and remembered by the children when speaking or writing. This had to do exactly with the way the spots’ visuals aided memory, clarified and enhanced children’s learning. At the same time, the topic of these spots, timely and universal, spoke direcly to children’s personal experience, holistically and emotionally. Their personal schemata were activated to make diverse associations, compare and contrast, and reflect on their rights and other children’s rights. Finally, the enjoyment they showed about the photo task had to do with the fact that it gave them a feel of ownership over the activity. I’m still getting new photos in my e-mail. This was the first lesson of the new school year with my 6th grade groups, twelve years old primary school children (A2- level of English). We greeted each other exchanging wishes for a productive and interesting school year ahead. The shiny little faces in front of me were all familiar from our previous years together, yet it always amazes me how fast children of this age can change in two months during the summer break. 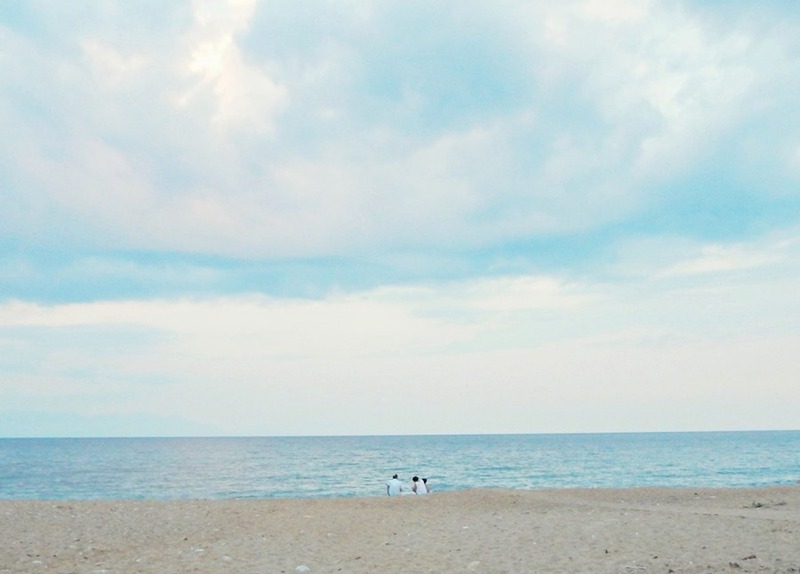 We were all a bit numb; half present at school and half reminiscent of the carefree summer days we had left behind. Since the school is still understaffed there was no fixed timetable so the element of surprise is strong. The 6th grade groups I would be working with that day had just been given their two new English books, and had piled them on top of the rest of the books for all the other subjects they will be taught this year; seventeen books in total. Their small heads were almost hidden behind this pile. I decided I was not going to ask them to open their books on this first day. This was going to be a forty-five minute session and after initial greetings and wishes we had about thirty-five minutes at our disposal. I asked them to close their eyes, think of their summer, and choose only one of their memories to share with the rest of the class. They would start with I remember and try to keep their answers short, up to five or six words. This was a brainstorming activity and it was not long before initial awkwardness receded and summer memories filled the classroom board. Students were speaking, listening to their classmates’ ideas, I was recording their responses on the board and they were taking notes. 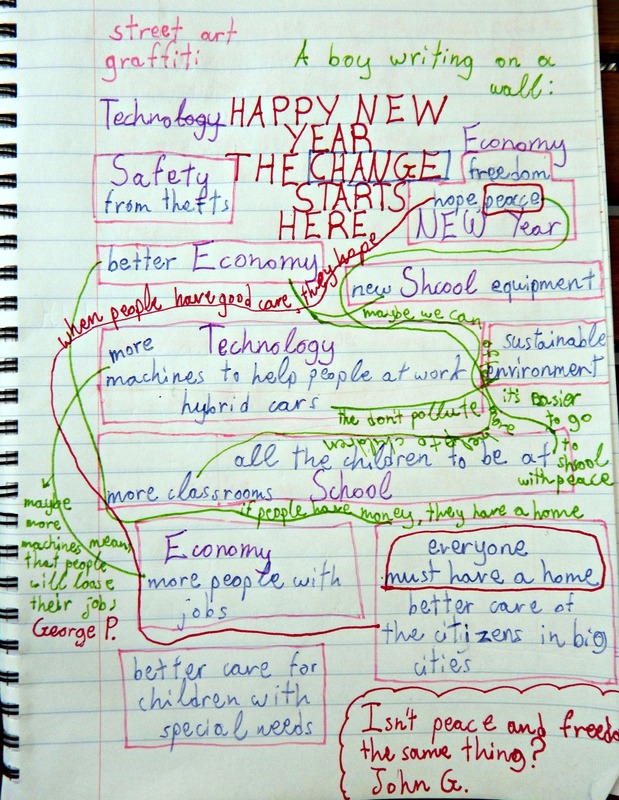 Here is an example of the brainstorming diagram we ended up with one of the groups. When we completed this step, I asked students to choose one of the memories shared because it was most important to them. I wrote on the board the first choice. It was “the sea view”. I asked: How was this sea view? They came up with “beautiful, gorgeous, colourful”. I added this as a second line underneath. Then, another student chose “riding my bike”. I wrote it on the board as the third line. I asked: Why did you like riding your bike? The answer was “Because I saw the sea”. 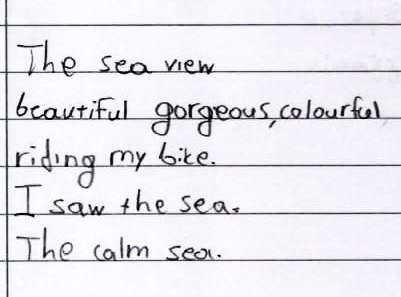 I wrote “I saw the sea” as a fourth line. How was the sea? was my last question. Calm, was the answer. I added as a last verse: The calm sea. We went on adding verses to our poem in the same way. Students would choose a memory and then I would ask them to add something relevant to it. The questions usually aimed either at encouraging them to come up with some descriptive language or explore and explain their feelings. The what, where, how, and why of their memories. Each stanza of the poem had four or five verses. The rough pattern was: memory-expanding on it-memory-expanding on it. Here is another example of how this activity worked with another group of eleven-year-old 5th graders I taught that day (A1+ level of English). Some of the stanzas turned out to be more coherent in terms of the overall meaning they communicated while others had unexpected associations. This is because children chose a memory at random from the initial brainstorming diagram, but it is also has to do with the actual way memory works. It does not work directly, you need to wake up different angles. I have been thinking after trying this activity in class that the “I remember” element could also work with other prompts; Christmas, Easter, a happy/sad day in my life. It would also be interesting if we asked students to think back and choose five to ten memories about people, places, events they have experienced. It will all be about using personal experience to write creatively. It was a nice first day at school. Students dived in their summer experience, voiced it, experimented with language and vocabulary, and communicated creatively and freely. 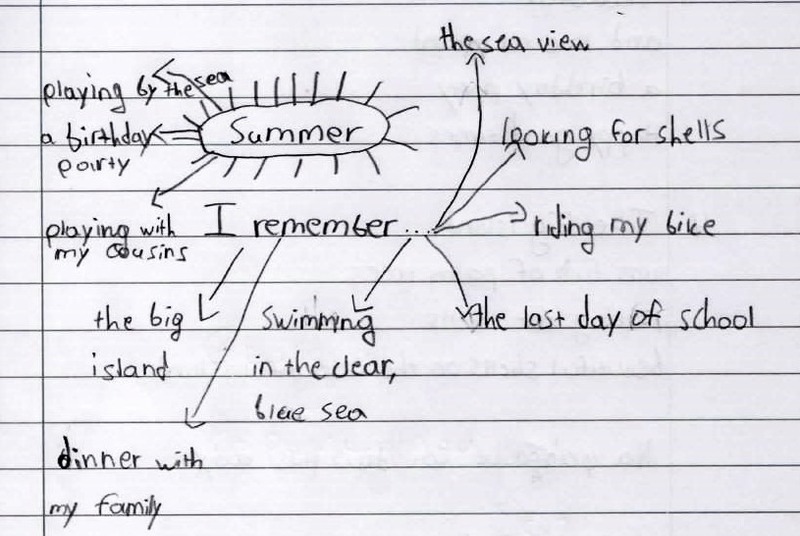 I was happy to find out in the next lesson that quite a few of them had tried to go on with writing short poems at home without having been assigned this as homework activity. In this post I will describe the Looking 10×2 thinking routine. It is a routine that helps learners slow down, concentrate, observe carefully and describe. The routine stems from the Artful Thinking programme, one of the programmes at Project Zero. It is linked by the theme Visible Thinking which aims at helping students develop thinking dispositions that foster thoughtful learning. Introduce the source material. This may be any kind of image, painting or artwork, especially visual art. Ask students to concentrate and look quietly at the source material for thirty seconds. If the source material is rich in details, you can extend the time to one minute. 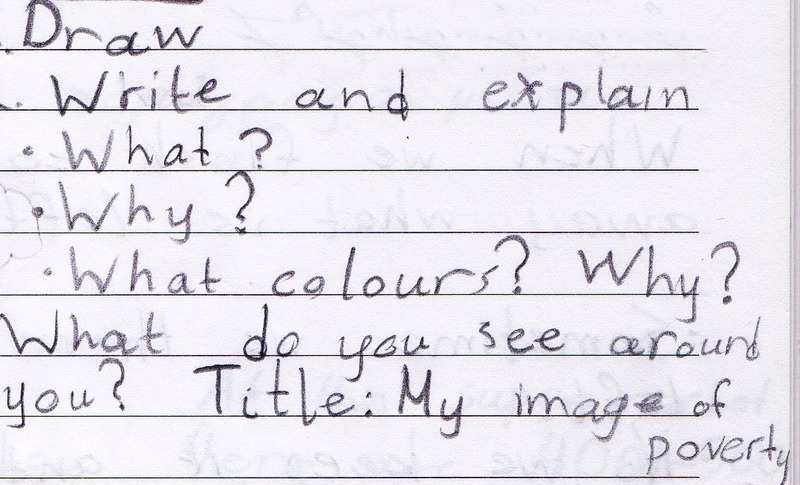 Ask them to take notes and make a list of up to ten words or phrases about any aspect of what they have just seen. In this stage students can work individually, in pairs or in small groups. Work as a whole class and share ideas. As students come up with their words and phrases keep a visible record on the board by using a brainstorming diagram or a concept map. A circle map works well with this routine. Ask students to take notes of the ideas shared in class. Repeat steps 1-4. That is, ask students to look again, add more words and phrases to their list, and share them. As this is a routine that helps students generate descriptive language, it is a useful springboard into a writing activity. After completing the routine ask them as a writing assignment to produce a short text reflecting on the activity, the classroom discussion or elaborating further on the thoughts and ideas the routine triggered. I have tried this routine on quite a few occasions so far with my mixed ability A2+ groups of 6th graders (twelve years old). The first one was with the topic of war/peace where we used Picasso’s Guernica as the source material. I did not tell them anything about the artwork apart from the title and the name of the painter. Students were highly engaged and motivated and came up with some interesting responses. Their responses involved references both to what was obvious (horse, bull, lamp, door, faces, feet) as well as attempts beyond it (lost lives, lost dreams, black world, death, fear). We used a circle concept map to document our words and phrases. Red marker was used for the words and phrases they came up with when we repeated the routine. Another occasion was with the topic of refugees. Here the source material was an illustration for World Refugee Day by Hanane Kai, a graphic designer. 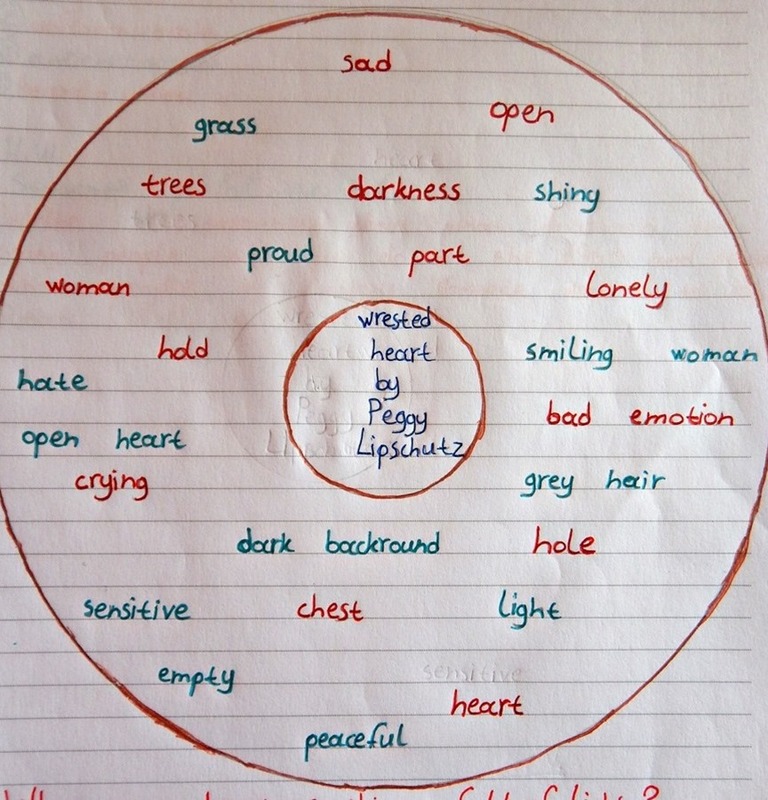 Again, students’ responses were recorded through the use of a circle concept map. A third occasion was with the topic of mobility disability. In this case the source material was an image by Ian James for ELTpics. This time we used a brainstorming diagram. The idea in this routine is to have students slow down their usual busy mode of work and spend some time to look carefully and think. Careful looking means taking time to notice more than what meets the eye at first glance. It is the observing and describing disposition that is at work here, a component of creative thinking, which is about noticing, thinking and communicating impressions. What I find interesting about the Looking 10×2 routine, and the same goes with all the routines I have tried in class, is that it serves what David Perkins calls “the optimal ambiguity” in an assignment. It is flexible for the teacher, structured enough to guide students, and open enough to let them discover their unique paths. 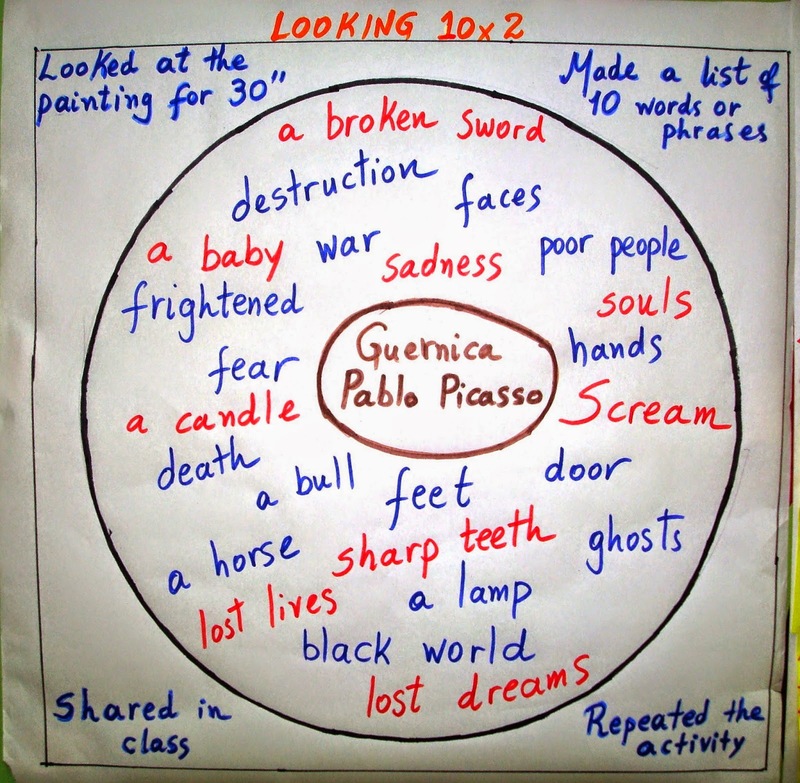 This openness results in a nice flow of ideas expressed in the English classroom. Using artwork as source material is enriching as it provides a nonjudgmental territory for students. Art is open to multiple interpretations, pushing students at the edge of what is and what isn’t; it is exploring, there are no incorrect answers and this is particularly important for students with low confidence. The routine is most effective when attached to a topic or content which gives students something worth thinking about. It can also be nicely combined with the See-think-wonder routine to push their thinking further. The routine may also be used with a piece of music as Listening 10×2. 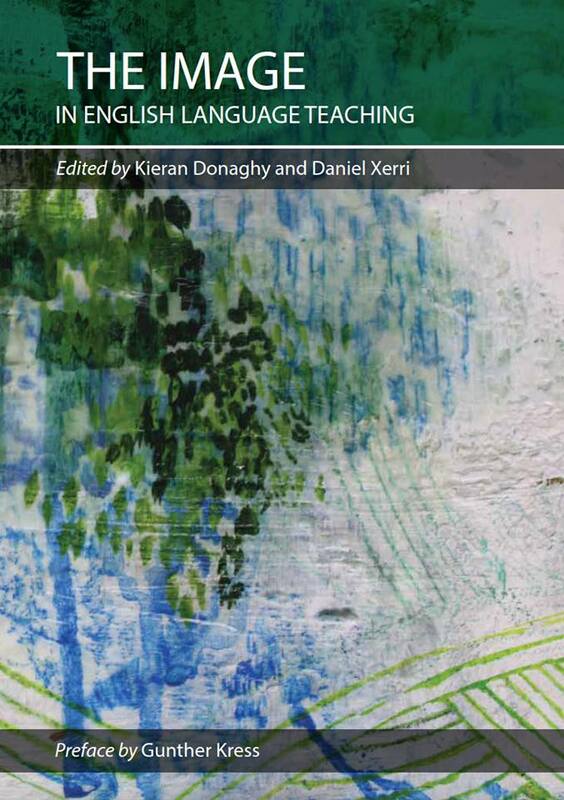 Papalazarou, C (2015) ‘Making thinking visible in the English classroom: nurturing a creative mind-set’ in Maley, A and Peachey, N (eds) Creativity in the English language classroom. 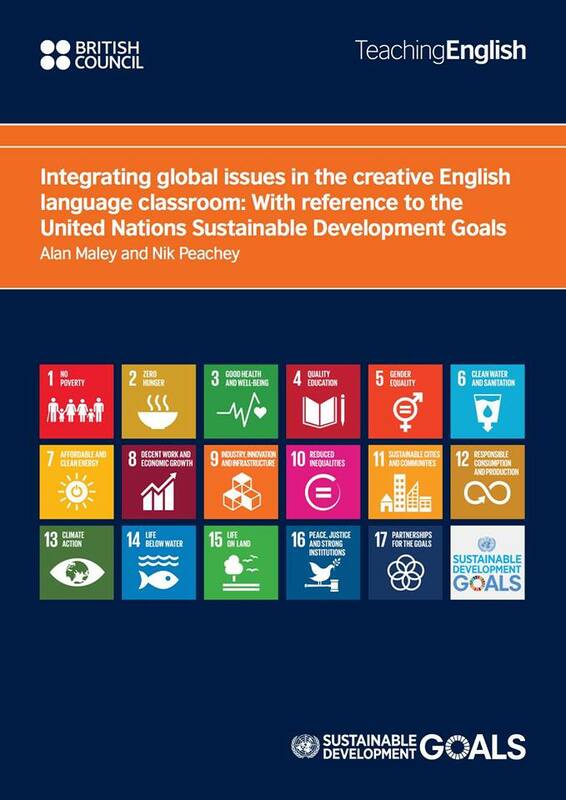 British Council: 37-43.